Probably the biggest determiner if you hit the target or not is trigger control. Now I am going to talk about pistol shooting in this article but you can take most of it over to rifles and shotguns and apply it. One the biggest problems people have in pulling the trigger really doesn’t involve pulling the trigger. It is the anticipatory push they give the pistol before shooting. It is the jerk you will see when someone has a misfire and the pistol doesn’t go off. You will see them dip the pistol and if they have a big push they might even lose their balance a bit. If the recoil is too much for you, you need a smaller caliber pistol or train more with the one you have to get used to the recoil. A beginner shooter should be surprised when the weapon goes off as they squeeze the trigger. That means they are applying even backward pressure and not anticipating the weapon firing. 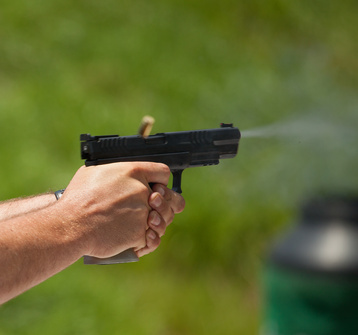 Now experienced shooters who have shot their weapon a lot will know how much pressure they can exert before the weapon goes off and can take out the slack before firing. A good exercise is to balance a dime on the front sight of an UNLOADED gun (you might need someone else to put the dime on the sight). With the dime balance keep the pistol on target and gently squeeze the trigger. If you are practicing good trigger control and not pushing the weapon you should be able to fire without dropping the dime. Let us know in the comments about any other exercises you know to help trigger control.